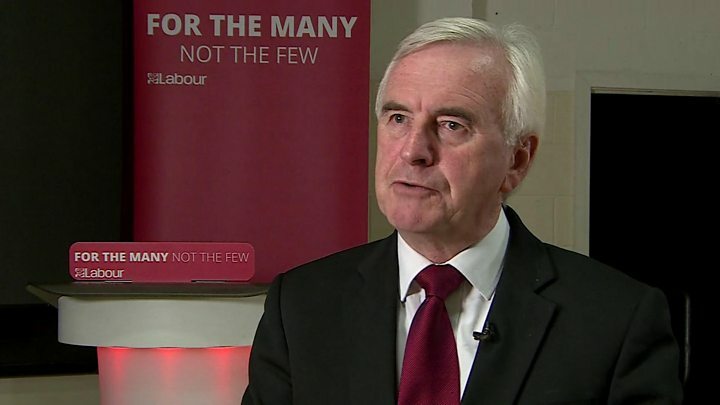 Media captionJohn McDonnell says Chukka Umunna should stop "throwing himself in front of TV cameras and inventing stories"
Shadow chancellor John McDonnell has rejected suggestions that MPs critical of Jeremy Corbyn are being driven out of the party. It follows claims by Labour MP Chuka Umunna that centre-left MPs are being run out the party, as he urged Mr Corbyn to "call off the dogs". Mr McDonnell branded the comments "grossly offensive", saying "our party members are not dogs". Some Labour MPs lost no-confidence votes by local party members this week. But the shadow chancellor told the BBC: "There is no campaign directed by the leadership, or anybody as far as I can see, to drive MPs out." Responding to Mr Umunna's comments he said it was "unacceptable" to refer to party members as "dogs". "They are the people who go out and deliver the leaflets, who canvas, who get Labour MPs elected and who secure a Labour government that will transform the lives of our country," he said. He told Mr Umunna: "Stop throwing yourself in front of TV cameras, inventing stories and get out there and start campaigning for a Labour government. " 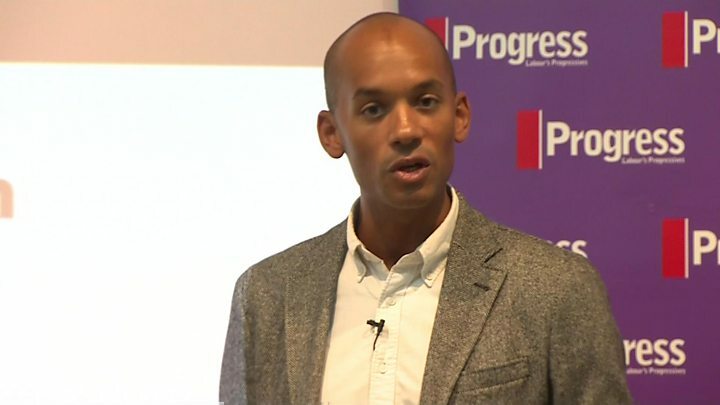 Media captionChuka Umunna tells Labour's leader to "call off the dogs"
In a speech on Saturday Mr Umunna - a leading member of the cross-party People's Vote campaign for a second referendum - warned so-called moderates were being "targeted systematically" and faced a "clear and present danger" of being run out of the party by hardline factions. Some critics of Mr Corbyn have faced battles with their local parties. This week Chris Leslie, MP for Nottingham East, lost a no-confidence vote from one branch of the local party while Enfield North's Joan Ryan and Luton South's Gavin Shuker also lost no confidence votes. Mr Leslie accused the party leadership machine of orchestrating the move. But Mr McDonnell insisted there was "no co-ordinated campaign" and it was "democratic" for members to express dissatisfaction with their local MP in this way. The votes carry no official force in the party. It comes as Mr McDonnell begins a speaking tour of the UK to highlight Conservative spending cuts. He launched the "road to rebuilding the economy tour" in Broxtowe, the Nottinghamshire constituency of Conservative MP Anna Soubry, on Saturday. Earlier this week, former Prime Minister Tony Blair said he was "not sure it is possible" for Labour "moderates" to take the party back from Mr Corbyn and the left - and hinted at the creation of a new "centre ground" party. Other Labour MPs who have lost local confidence votes include Frank Field, who quit the parliamentary party last week - citing the handling of the anti-Semitism row and bullying in local constituency parties - and Kate Hoey. Graham Stringer won a confidence vote in his constituency. These ballots were organised by activists angry at Mr Field, Ms Hoey and Mr Stringer's decision to back the government in Brexit votes, which they say robbed Labour of the chance of forcing a general election it could have won.